Over the weekend, I celebrated my 46th birthday by trying to run a nighttime marathon, which consisted of eight, roughly 3-mile laps around a lake near Boston. 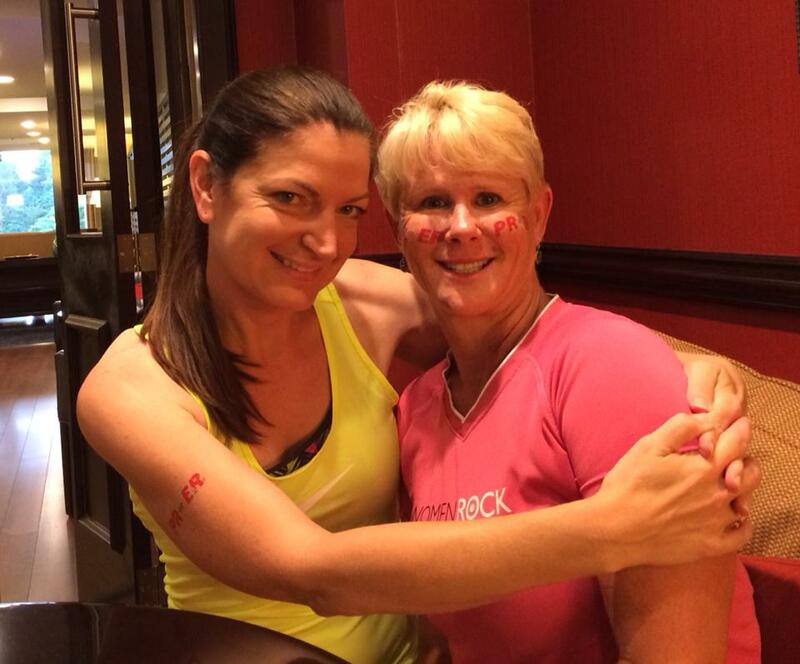 My friend Lisa and I were running it together to try to qualify for next year’s Boston Marathon. When it was clear early on that she wasn’t going to keep up our intended pace, I ran ahead of Lisa. I felt great for the first 11 miles or so. Thoughts of how awesome it was going to be to get my personal best marathon finish time and possibly even qualify for Boston flashed through my mind. It was obvious that I was dehydrated, unable to even absorb water or Gatorade and I had to make trips to the port-a-potty in between laps. Woozy after the 7th lap, instead of starting my 8th and final lap, I headed to the medical tent. The medic ordered me to eat a couple of handfuls of goldfish crackers—to get salt into my system—before he would let me walk the final lap. I scarfed down a ton of goldfish and pretzels and my stomach felt much better. My legs, however, were extremely fatigued and the thought of continuing around the lake one more time seemed pointless. I stared at the finish line and watched the reaction of the other runners as many completed the marathon and others proceeded back around the lake to either complete their marathon run or to keep going for the full 24-hour ultra-marathon. Just when I was about to walk over to the car to try to sleep on the wet grass and wait for Lisa and Brad to finish, Lisa crossed the finish line. I ran to meet her, so happy that she had finished the marathon, even though it was without me. Lap #8 was without a doubt the best part of the race. It was much more enjoyable to chat and catch up with Lisa than it was to tell Brad at mile 11 that I was on Boston qualifying pace. We finished together with the most incredibly horrendous finishing time of 5 hours and 53 minutes, at 2:53 in the morning. Considering how close I came to throwing in the towel, it was actually a victory, wasn’t it? And, as you might expect, we’re signing up for other marathons as we speak, keeping alive our dreams of qualifying for the Boston Marathon. To be completely honest, when I set my secondary New Year’s resolution goals of losing 20 pounds and getting my Personal Record (“PR “) marathon time, I knew that I would be successful. Sure enough, last week, I announced that I’ve already lost the weight. And — knock on wood — with my first marathon of the season just a few weeks away, I feel confident that I will get my marathon PR early. To help ensure that I get my PR, I already contacted the Vermont City Marathon’s 4.5 hour pace team to introduce myself. Since my fastest marathon time so far is 4:31:10, sticking with this group will help me squeak in a new record. I’ll let you know whether or not I am successful over Memorial Day weekend. Since I realized early on that these two sub-goals were sandbagged, I announced another goal for my dry year about a month ago. It’s the big kahuna: qualifying for the Boston Marathon. This is a “stretch goal,” defined as a goal that “cannot be achieved by incremental or small improvements but requires extending oneself to the limit to be actualized.” Some people might even say that it’s impossible for me to “Boston Qualify,” or BQ. I mentioned my current PR marathon time above. To qualify for Boston, I need to cut more than 35 minutes off my best time. Do I think I can do it? You bet. However, like everything else worth striving for in life, it will take goal setting, commitment, and follow-through. This is a great summary on how to set athletic goals. In order to BQ, I am now approaching every single workout with multiple goals in my head: the minimum I will accept, the true goal, and the stretch goal. I find that I am reaching these true goals and, such as in the half marathon last weekend, I am sometimes even surpassing the stretch goal. I’ve already significantly improved my chances of cutting 35 minutes off of my marathon time by quitting drinking and losing 20 pounds. In a previous blog post I shared this summary given to Princeton athletes on the negative impacts of alcohol on athletic performance and this Runner’s World article about how running weight makes people faster. Additionally, I am committed to a more aggressive training plan, Hal Higdon’s Marathon Intermediate 2. Compared to my past training, this plan requires me to run three times during the work week, with the Wednesday run peaking at 10 miles. It also has a very rigorous weekend running schedule that features a Saturday run at my planned marathon pace that also peaks at 10 miles. Running at pace on Saturdays means that I have to run the Sunday long run fatigued. Speaking of the Sunday long run, a beginner’s training program peaks with an 18-mile run, and an intermediate program peaks with one 20-mile run. This plan requires that I run three 20-mile training runs. Honestly, that’s rough. A seasoned, marathon-running friend, who is affectionately known as “B-Rad,” once told me, “I run marathons at a minimum every third week, because I hate those long training runs.” I do, too. So, with B-Rad’s training in mind, I have scheduled two marathons prior to my BQ race, as well as three half marathons. This helps me mentally by limiting the number of long training runs. From here on out, I just need to do one each of a 15-, 16-, 18- and 20-mile training run in preparation for my BQ try on July 25th. Since my recent half marathon performance exceeded my stretch goal, I absolutely believe that I can qualify for Boston. This was my first sub-2 hour “half” since 2006 (see my Arizona Road Racer results here). My time of 1:55:57 in the Middlebury Maple Run was 21 minutes faster than my own performance in the same race last year. A year ago, I placed 44th out of 62 women in my group, women in their 40’s. This year, I placed 10th out of 54, well into the top 20% of my group. I checked in with Runner’s World’s Race Times Predictor to see how this half marathon performance should translate on marathon day. It equates to a 4:02:00 marathon time, 29 minutes faster than my current PR but seven minutes slower than what I need to BQ. This is great news! Vermont is hilly, while my BQ course is flat. 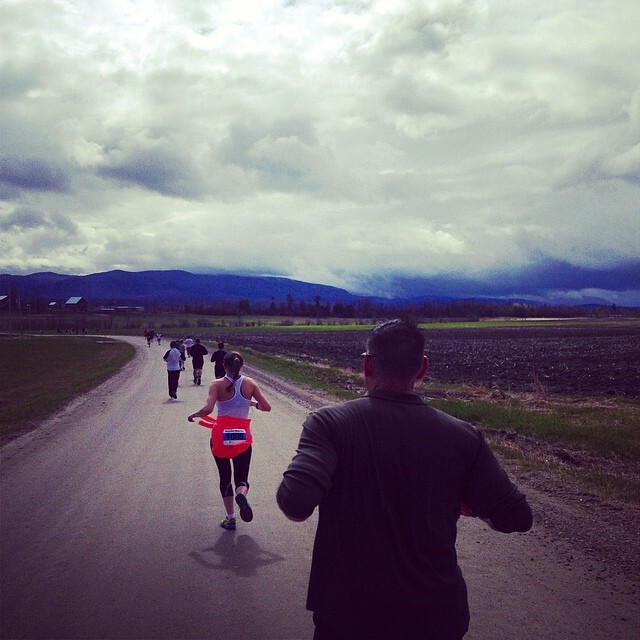 Middlebury has a lot unpredictable and varied terrain, while my BQ course is a five-mile loop that I will run multiple times. For good measure, I also put my target marathon time into the Race Times Predictor and learned that a 1:52:00 half marathon time is equivalent. I’m trying for that time, a PR for that distance, in the Crowley Road Race in early July. Wish me luck. And, as you might expect, I’ll let you know how it goes. As you can imagine, taking alcohol off the table is a good first step for both my diet and training goals. I’m encouraged that I lost 6 pounds so quickly and also that I felt great on my 6 mile run earlier today. In this post, I focus on two questions. Exactly how does alcohol impact diet and exercise? And, given my two ambitious goals, where do I start? This article is a great summary of the detrimental effects consuming alcohol can have to your body and diet. In a nut shell, the human body has trouble processing alcohol, because it contains a bunch of calories with no nutritional value. This can slow your metabolism and contribute to weight gain, not to mention the direct effects of consuming all of those empty calories. Alcohol also has several negative impacts on athletic performance, such as causing dehydration and reducing performance through lowered glucose production. This summary article provides more detail on this, as does this one from the Guardian, and this one from Runner’s World; the latter focusing on impacts to running performance. The best one-stop-shop on the range of negative impacts alcohol has on the athlete is this amazing brochure from Princeton, produced by the NCAA. Given all of this, I’m really happy I don’t have to worry about how drinking wine is going to affect my diet and my marathon training this year. It took just a few additional minutes of research and a lot of common sense to realize that I should lose the weight first and then concentrate on my training. Exercising certainly can help you to lose weight. But, the reverse is also true. I noticed as I trained for multiple long distance races through the years that it’s a real pain to lug the extra pounds around, literally and figuratively. I also found that when I’m seriously training for half and whole marathons, I tend not to lose weight, because I eat more, both from being hungrier and from feeling I’ve earned it. With these multiple inputs and outputs, how am I going to keep it all straight to make sure I actually lose weight? That’s easy. I’m going to use MyFitnessPal to track my calorie consumption and stick to a specific daily calorie target determined by my goals and inputs when I created my account. As I exercise, I also log that into the daily diary and it will allow me to consume more calories. It’s easy to use and completely free. I use the mobile app version and do most of my tracking on my iPhone. There are a ton of great features, including a prediction when you complete your daily log of what you will weigh in 5 weeks, “if every day were like today.” This is motivational both on good days and bad. This month and in March, when push comes to shove, I commit to focusing on my diet first and my training regime second. Hopefully, I’ll get within 5 pounds of my ideal weight by April Fools’ Day, allowing me plenty of time to crank up my training schedule for the race season. If all goes according to plan, I’ll be aided by a 30 second reduction in my average pace from the weight loss alone.